Haven't had a video yet this week, so I was looking through them and found this video from Kevin Goodman and Michael Thomason. It's entitled "Scriptable Virtual Channels," and it covers how to create your own virtual channel for Citrix or Microsoft (with some information on Windows Server 2008) SBC products. transfer files between the Citrix server and the client and vice versa. run applications on the client or collect information on the client based upon events on the server. To watch the video, click the image below. To download the supporting files for this session, click here . 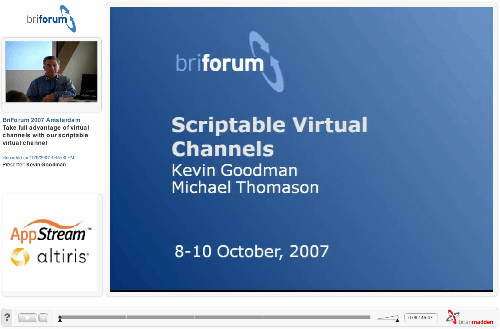 If you want to suggest a video for release, check our the session lists from BriForum 2007 Chicago and BriForum 2007 Amsterdam and let me know. BriForum 2008 Chicago takes place on Navy Pier from June 16-18 and is open for registration right now. I sure don't. I was looking for it myself, and was going to email. If you can send it to me, I'll get it up there ASAP. If that code is available, I'd love to check it out, too. Please email with details if available. Kevin: you mentioned that this might be opened up to the community to build and improve upon. Did that ever happen, if not why not? This would solve so many problems we face with remote laptop users who can rarely make it into the office to get local updates. The code is coming soon - I talked to Kevin and he said they've already updated it since BriForum. He's going to create a page on RTOSoft.com for it so that it will always be up-to-date. When he does, I'll post it here and in the session information on BriForum.com. Ok, the code is up: http://www.rtosoft.com/documents/support/Vdbriforum.zip . Thanks to Kevin for putting this on his site and keeping it up-to-date. If you guys think about it, it'd be cool to read about your experience with it. Maybe you could post here when you've worked with it for a little while? I downloaded the zip and it includes SOURCE! I just want to say thanks to Kevin for providing this. It is pretty rare that you get something for free from a vendor these days. What are the restrictions? I noticed the RTO copyright. My reflection: Nice to have knowledge shared, I'm grateful for that. Allthough that I cannot see any real use of the info provided it's still nice overall.